While the headlines swirl around Donald Trump and the anarchy upending the GOP, little attention has been paid to the most recent incident of political hacking. On Tuesday, Wikileaks released a third batch of emails, purportedly from John Podesta, Hillary Clinton's campaign chair. The first batch was published last week, while a second of 2,000 emails dropped on Monday. 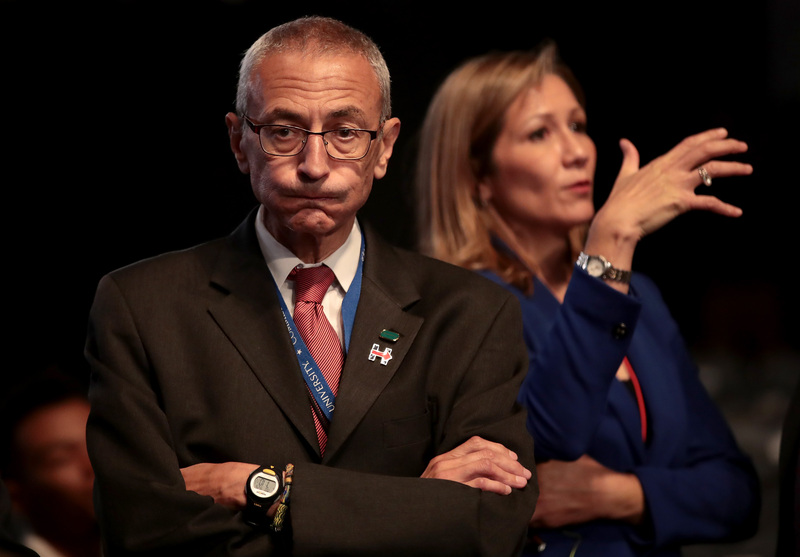 The leaked emails show exchanges between Podesta and Clinton's aides, donors, and other politicians. This election cycle has been plagued with incidents of hacking, from the DNC hacks in July which prompted chairwoman Debbie Wasserman Schultz to resign to former Secretary of State Colin Powell's email dump last month. In almost every instance, the hackers have been linked to Russia by many top experts. Last week, the Obama administration formally accused Russia of trying to hack U.S. political groups and figures in an attempt to tamper with the election. The Clinton campaign has not confirmed or denied the authenticity of the emails. Some hacking experts speculate that by initially providing legitimate emails, hackers with nefarious goals could later release pages with false information mixed in, casting doubt on anyone who would deny them. Still, Clinton critics are having a field day with the Podesta emails. Here are the standout moments that political analysts are jumping on. The Podesta emails show that the Clinton campaign had a folder of Bernie Sanders attacks ready to be deployed during the second primary debate. Another email shows a congressional aide accusing Clinton of perpetuating false comments about her opponent. Clinton wanted to a film a "straight-to-camera" video response to the claims in the 2015 book Clinton Cash, which detailed the criticism she has faced that being involved with the Clinton Foundation while serving as secretary of state was a conflict of interest. "She believes she needs to do this video is because her integrity is being attacked and she is the only one who can say she didnt [sic] make a decision as secstate [sic] based on a donor," top adviser Huma Abedin said in an email on May 1, 2015. After Sanders attacked Clinton for her Wall Street ties, some aides wanted the candidate to hit back by challenging Sanders' understanding of finance. "HRC does not want to call Bernie out by name in her speech Wednesday night, but she does want to drive a more effective and comprehensive contrast with him. In particular, she's keen to find a way to keep going after him on Wall Street (she's convinced his plan is naive and unworkable) as part of a broader indictment," wrote Clinton's director of speechwriting, Dan Schwerin, in an email dated Jan. 6. But others warned that responding that way was exactly what Sanders wanted, and that she would be playing into his strategy. "I agree with you. Bernie wants a fight on a Wall Street. We should not give him one. Our polling shows this is one of our weakest areas," replied campaign adviser Mandy Grunwald. In 2014, an email from Clinton to Podesta outlined her plan for countering ISIS in the Middle East. It also included her belief that the terror group received "financial and logistical support" from Saudi Arabia and Qatar — nations which are allies of the United States. Emails show that at the start of the primary season in 2015, Clinton's campaign was concerned that Republican candidate Marco Rubio was a potential threat to a Clinton presidential victory. They feared he would appeal to young voters, like Barack Obama during his 2008 run for the White House, as well as Latinos. “It’s interesting to compare/contrast with Obama 08," one Clinton staffer wrote. In another email, chief strategist Joel Benenson wrote of Rubio, "He had stronger right wing cred than Jeb and he's finding a way to the middle enough for now and he will be the most exciting choice to Republicans. Could pose q real threat with Latinos." In 2015, Haim Saban, chair of the Spanish-language TV network Univision, urged Clinton to go after Trump on his comments which characterized Mexicans as rapists and drug dealers. Saban, a top donor, said she needed to call out Trump, as well as Republicans for not condemning the remarks, to make headway with Latino voters. “Haim thinks we are under reacting to Trump/Hispanics. Thinks we can get something by standing up for Latinos or attacking R's for not condemning,” campaign manager Robby Mook’s email from July 3, 2015 stated.